Comodo's exclusive Corner of Trust technology ensures consistent placement of the HackerProof TrustLogo® throughout your website. 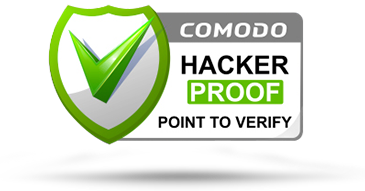 The Comodo HackerProof exclusive Point to Verify technology invites more interaction, building trust for your web site. Comodo's exclusive, patent pending technologies enable you to present your credentials on your website instead of navigating off to a vendor site and potentially losing sales. The trustmark appears as part of your web browser, providing more website credibility and not requiring you to change the layout of your web pages to accommodate the TrustLogo®. Not vulnerable to popup blockers -- Comodo's patent-pending technology uses rollover functionality to show visitors that your site is, in fact, trusted. Not Self-Promoting - Unlike other vendors, Comodo does not intrude on your website visitors to take other actions and potentially steal your valuable business. Over 100 million people associate the Comodo brand with security and trust. Is your TrustLogo® recognized as a trusted brand? Does the trustmark come free of charge with the ability to test it to see if it increases my sales or not? Is the trustmark always visible? Put HackerProof on your website and pay nothing for a risk-free 90 day trial*!